So we just recently got one of those Instant Pot pressure cookers. It’s pretty great for high temperature/pressure cooking, light canning, and slow cooking. There are lots of different pressure cookers to choose from – we got the Instant Pot because it has multiple modes and has Bluetooth smartphone connectivity. Pressure cookers don’t have to be as expensive or complicated, and are much more common in European and Aisan homes and commercial kitchens, which is a shame – it’s a great tool for any kitchen. The Instant Pot works great as a steamer, but the it doesn’t come with a large basket. One cool little hack people are doing is buying this 3 quart mesh basket which fits inside the cooker – except for the handles. It’s common enough that it shows up in the “commonly bought with” section on Amazon. So, I was asked to remove the handles off one of these today. My first thought was to grab the Dremel tool, but that seemed excessive and I didn’t want to deal with sharp edges. The handles are just spot welded on to the brim, so I figured it should be relatively easy to break the weld point. I don’t have any experience with these, so I did a little research. Everything I see are about using pliers or a shop vice. But all you need to do is hold the rim near the handle with one hand, and rock the handle back and forth (perpendicular to the rim) with the other hand. You don’t want to bend the rim, so start off gently, but the handle will move. The spot weld is a weak point, and without too much force it will break off. Sunday April 17th 2016 is the annual Greater Los Angeles Walk MS. This is the fifth year I’ve done the walk, but this is the first year I’m trying to raise money for the National MS Society. So far, I have raised over $1100 for the National MS Society. Please consider supporting this cause by donating to my National MS Society fundraising page. All donations go directly to the National MS Society. They are a national charity that supports those with Multiple Sclerosis and fund research for treatments and a cure. More than 80% of their money goes to non-fundraising programs. If you have a rice cooker, you know that little measuring cup you’re supposed to use to measure the rice? How big is it? If you lose that little cup, how do you measure your rice? You can pay as much as $10 for a replacement cup, which is insane given that you can buy a cheap-o rice cooker for $15. You may as well buy a new rice cooker! However, I have a 3D printer, so the idea of paying anything for a tiny bit of injection molded plastic seems pretty silly. But the question was how big is that cup? It doesn’t match any other measuring device in the kitchen. It’s close to 3/4 cup, so some rice cooker manufacturers recommend that. In truth, the important thing is the ratio of rice to water, though it depends on the type of rice (anywhere from 1.25 to 2 parts water to 1 part rice), and there is a fair amount of leeway on the precision. My rice cooker is a “neuro fuzzy logic” Matsushita model imported from Japan many years ago when smart rice cookers were just becoming a thing in Japan but weren’t yet available in the U.S.. I paid a pretty penny for it, but it gets lots of use and it still works today. 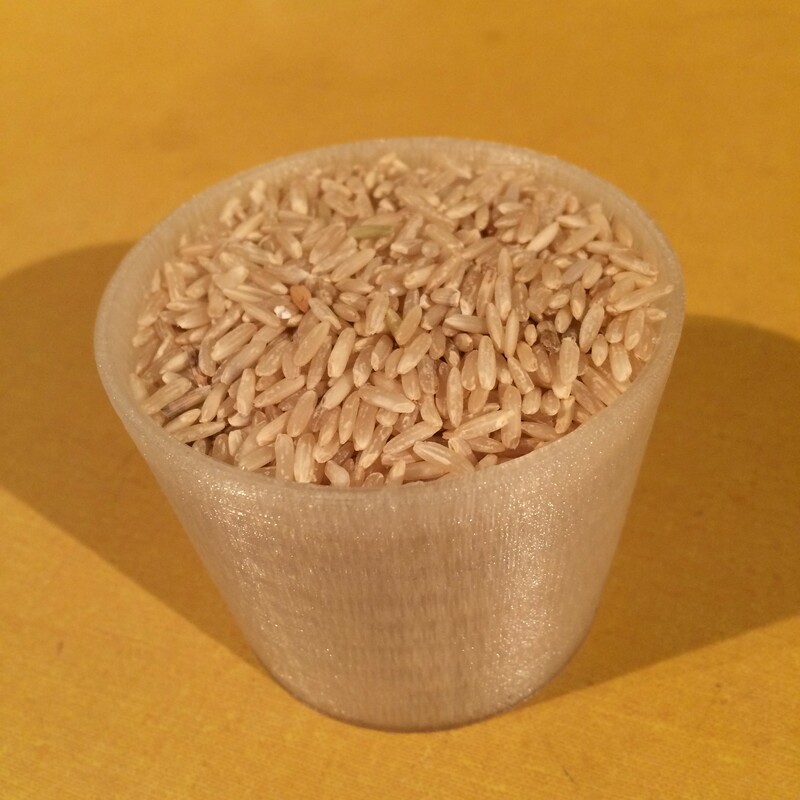 The bowl has markings on the inside to fill water based on the type of rice and number of measuring cups of rice. So the cup is super convenient and it would be a pain to have to measure both rice and water. So how big is the rice measuring cup? The rice measuring cup is 1 gō, an archaic unit of measurement that is essentially defined as one serving of rice. The whole system of measurement is called Shakkan-hō, named after two of the primary units: Shaku (length) and Kan (mass). (No relation to the stage name of the singer Chaka Kahn.) It’s derived from a Chinese system that dates from the 13th century BC, and were adopted by Japan in the 8th century BCE. It was abandoned in 1924 for the metric system. A gō is 1/1000 of a koku. A koku was originally defined as a the amount of rice needed to feed one person for one year. Given something between 2-3 servings of rice per day, a gō is a single serving of rice. Koku was also used to measure the capacity of cargo ships, and to determine taxation. A koku is about 40 gallons, or 180.4 liters. Which makes a gō 180.39 milliliters, which we can safely round down to 180 ml, which is 0.76 cups or just a smidge over 6 fluid ounces. (This is the size of the original Coca-Cola soda fountain glasses, so you can use one of those for measuring your rice if you want). Right now I’m on a ship at sea somewhere between Canada and Alaska. I say somewhere because we’re completely fogged in and I can’t see a thing past the deck rail of the ship. When I got married just over ten years ago, my wife and I decided to take an Alaska cruise for our honeymoon. Some friends of my wife book specialty cruises and work with all the cruise lines. They suggested Holland America Line because they had a reputation for dealing with the special dietary needs of their passengers. It worked like a charm ten years ago, and things have only improved in the years since. It makes sense – put thousands of people on a floating city, and try to serve them food from one kitchen, and you’re going to have to deal with allergies, picky eaters, and whatnot. The good news is, they can accommodate you. The bad news is they aren’t all that good about letting you know this. And you have to do some of the work. But you should be use to that by now. Yesterday I was craving pizza at lunch and my go-to place was closed. A trip into the new Pizza Rev restaurant scared me a bit seeing the opportunity for cross-contamination. Despite the assurances on the web site. They have a contact form on their web site so I asked if there was something I didn’t see. Within a couple hours I had a response! special pie-tin to avoid contamination from the oven. do it so you can decide for yourself. Thanks for your email, Theron! Well, that certainly sounds promising. So I decided to wander in after the lunch rush today. Everything went the way Jeff described. It is very refreshing to see a restaurant differentiate between people wanting to reduce the amount of wheat they are eating for personal preference and those who have medical reasons to avoid it (allergies or Celiac). After I said I had an allergy, the server immediately changed her gloves (without being asked! ), went down to the end of the line and grabbed a clean pizza tray and put my pizza crust on it. The sauce came from a squeeze bottle, and they had a stack of clean ladles to use for spreading (one use only!). Very nice. The pizza was pretty good. The rice-based crust is actually very similar to ZPizza – thin and crispy, with a slight spongy texture. I had a red sauce pizza with mozzarella and pepperoni (I always have a ribeye the first time at a steak restaurant just to compare the basics). The sauce was a tad sweet for my taste, and the cheese is a bit plasticy (low moisture mozzarella can get that way). But it was pizza and it was yummy. I will be going back and trying some of the many choices they offer. 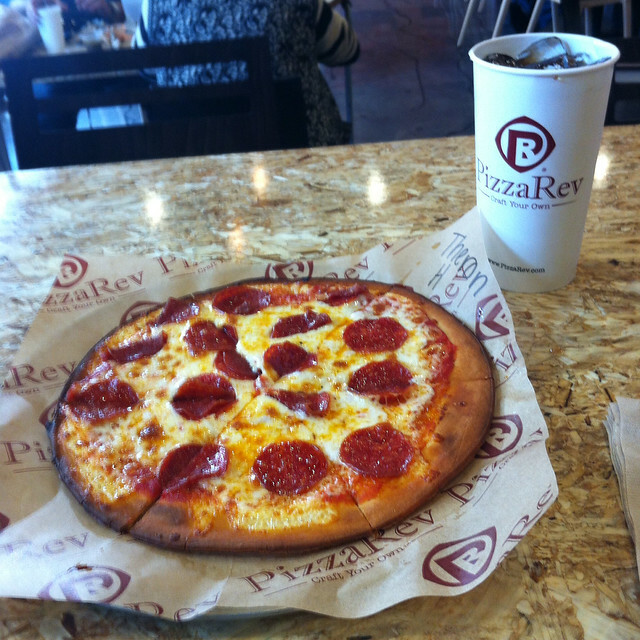 It’s good to have a lunchtime pizza option. I have been working in Burbank since before I was diagnosed with my wheat/rye/barley allergies. Lunchtime pizza options have always been limited. Unfortunately, they have gotten worse. But there may be a silver lining here. There was a Garlic Jim’s Pizza over on Glenoaks, and they have an OK pizza crust and they took care to avoid cross contamination. But they were a franchise and they became an independent pizza place called Gourmet Crust Pizza. I probably ate there once a week, but then I started having bad experiences. Food poisoning, feeling generally icky, etc. 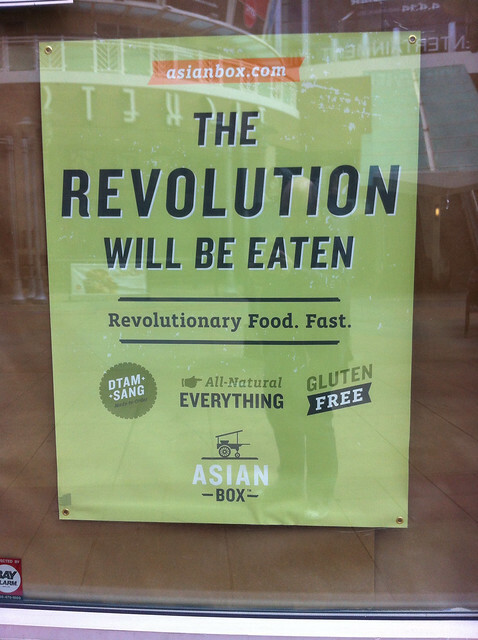 So I have stopped eating there. There was a ZPizza in the media district, and I like their crust – it’s not a fluffy traditional crust, but for a thin and crispy crust it’s not bad. I used to go there when I was working on Flower Street, right across the freeway overpass. Today I was craving pizza, and since Gourmet Crust was out of the picture, I headed for ZPizza. Only to find them closed. Le sigh. It’s been a while since I’ve been to that area, so I have no idea when they closed. It was recently enough that the sign is still up and there was still paper up in the windows. But long ago enough that there were hard hats inside installing a new restaurant. Then I saw a couple kids with pizza boxes. And almost across the walkway (this is Palm Ave, which used to be a street that ran in front of the old AMC theater, but is now a pedestrian mall, with the new AMC theater across the way) is a Pizza Rev. A quick bit of google-foo on my phone tells me they have a gluten-free crust. Okay, let’s go check them out. They build the pizza in front of you, like Subway or Chipotle. And what I saw freaked me out a bit – they have vats of their sauce options on the line, and they use the ladle to spread out the sauce on the crust. And then they stick it back in the vat. This seems like an obvious source of cross-contamination. It’s the reason to ask for spread on the side at In-N-Out – they put the spatula back into the spread after putting it on the buns. I have contacted them to ask about this, but have not heard back yet. Aharn Dtam Sang is Thai street food, I think. 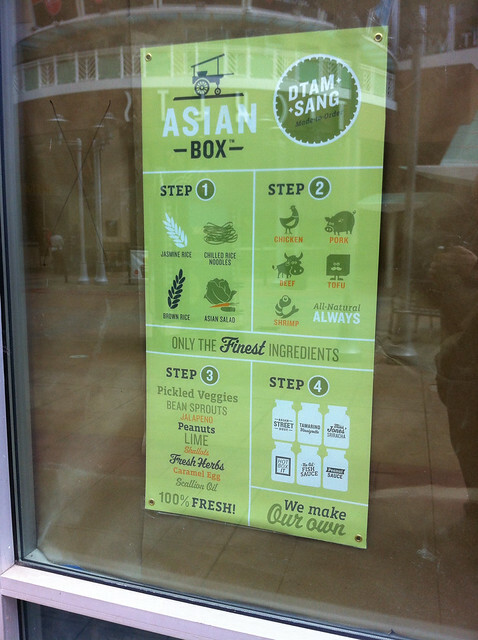 It looks like they have a wide variety of rice/rice noodle dishes made to order. This looks promising. I look forward to trying it when they open. I got a sous vide immersion heater/circulator just before Thanksgiving, and I’m loving it. Sous vide is a method of cooking that involves putting food in vacuum sealed bags, and using heated circulated water to cook it, usually at relatively low temperatures for relatively long periods of time. 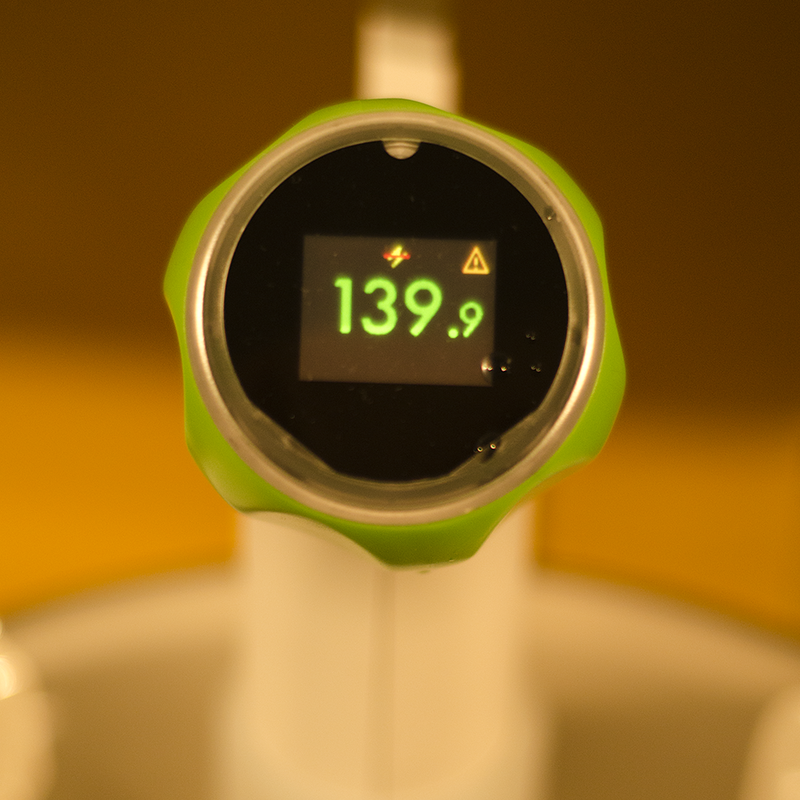 It used to be the sole domain of restaurants, and sous vide cookers are usually large and expensive. But there are now a few home units that are affordable. I picked up a Nomiku when it was a Kickstarter campaign but they can be ordered now for about $300. That’s a lot of money for a kitchen gadget, but this one is going to get a lot of use in my kitchen, and it’s a bargain compared to the $1000+ commercial units. I was going to build one using an immersion heater, an aquarium pump, a thermocouple, and a PID controller. The parts would have been less than $100, but I was going to have to build an enclosure for it and find a suitable container for the water bath. And I’d have to tune the PID controller to keep it accurate. The Nomiku was more expensive, but it was more convenient. It clips on to the side of a stock pot, so it packs away nice and easy. It’s easy to use – plug it in and turn the knob to set the temperature. It circulates the water in the pot, heating it up to and keeping it within 0.2 degrees of the target temperature. So why is this useful? Because it lets you bring the temperature of your food to precisely the temperature you want, which gives you better control over how the food turns out. I love P.F. Chang’s and the fact that they put a gluten free items right on the menu. Today is my birthday and I’ve been craving P.F. Chang’s lately, so we that’s where we went for dinner. The menu was re-designed since I was last there. Giselle noticed that the GF Ginger Chicken With Broccoli was a dollar more expensive than the non GF-version of the same dish. We asked the waiter about it and he wasn’t sure why it was more. Maybe the GF sauce was more expensive, he said. Turns out all of the dishes (except for the Egg Drop Soup) are more expensive on the GF menu. By one dollar. Each dish. All Gluten Free items are served on a special plate with the P.F. Chang’s logo. These menu items are either gluten free as prepared, or are modified to be gluten free. The following ingredients are used in P.F. Chang’s gluten free sauces: chicken broth, oyster sauce, rice wine, sugar, water, wheat free soy sauce and white pepper. The marinades for beef, pork, chicken, shrimp and scallops are gluten free and contain cornstarch. The soy sauce on the table is not gluten free. Please ask your server for our gluten free soy sauce. I’ve honestly never compared the GF menu pricing. It’s probably always been that way. But why? There’s nothing particularly expensive in that list of ingredients. Certainly they use all that stuff in the kitchen anyway. Maybe not cornstarch, but cornstarch is so cheap it is basically free (at least the teaspoon they use of it). I appreciate that they go out of their way to make it possible for GF folks to eat there. It may cost them to stock ingredients they might not otherwise use. But by being generally GF friendly, they’re getting customers they wouldn’t otherwise have. Given their prices, an extra dollar isn’t that much money. But I feel like I’m being punished for having a wheat allergy and patronizing their restaurant. We pointed out the extra cost on the ginger chicken to our waiter. Without us asking, he deducted a dollar from our bill, which was rather excellent of him. But we paid the extra dollar on the other three things we ordered off the GF menu. I expect upscale prices when I go to P.F. Chang’s. It’s not an everyday restaurant. And I never objected to the GF menu prices. And them being careful and using special ingredients is worth something. But it seems an arbitrary and nonsensical upcharge for something I’d think they would be willing to do to for their customers. Kickstarter is a great crowd-funding site that lets people propose projects and seek funding from the internet. If the project meets its goal, pledges are collected. Occasionally, a gluten-free food project pops up. There’s a new one called Easy Eats – It’s Good To Be Gluten Free. It’s a digital magazine that’s looking to expand.